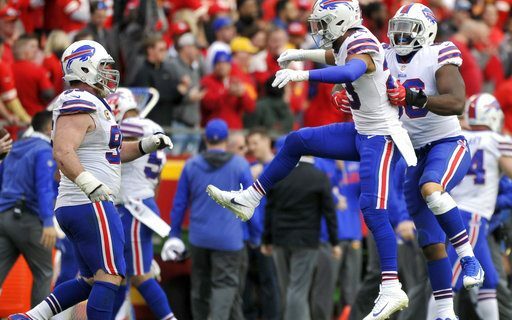 The Buffalo Bills started the season off quickly by winning three of their first four games and five of their first seven. Getting to the playoffs looked like a distinct possibility. But then adversity hit and the Bills lost not only three in a row, but they were blown out in each of those games. Going into yesterday’s game it was what we refer to as a “must win” situation. The result of the game could show us in which direction the 2017 edition of the Buffalo Bills was headed. Having to go on the road and play a team that was is a similar situation was no easy task. But the Bills played their best game in a month and came out winners by a 16-10 score. This win was huge for the Bills for a variety of reasons. First the game meant a lot to rookie Head Coach Sean McDermott. After three straight losses it was going to show us how good a coach McDermott could be. After three blowout losses he was able to get his team back on track especially against as difficult a foe as Kansas City on the road. Second, Kansas City Head Coach Andy Reid was/is McDermott’s mentor. A win over Reid had to be extremely satisfying for McDermott. Third, it proved to the players that if they play as expected they can overcome adversity and be like the team we saw the first six weeks of the season. If the Bills are going to have a shot at making the Playoffs the worst they can finish the season is 9-7 and that might not be good enough. They have to play two games with AFC East leader New England as well as two games with another AFC East rival, the Miami Dolphins. The other remaining game is versus the Indianapolis Colts at home. Needless to say they need to sweep the Dolphins series as well as beat the Colts. New England will of course be a different story, and we can’t count on a win in either of those two games. What I think it may get down to is if the Bills can pull off a split with New England and win the other three they are most likely in. How do they do that? The defense has to play like it did yesterday. They did a great job shutting down the Chiefs run game and with the pressure they put on Alex Smith, they limited the Chiefs passing attack. Without doing the same on defense the rest of the season, the Bills could be in trouble. On offense, quarterback Tyrod Taylor has to improve. Nothing he did against Kansas City showed us he shouldn’t have been replaced a week ago. For the day, he only completed 19 of 29 throws for 183 yards. He still has not been able to get the wide receivers involved in the game. Of the 19 completions, only six went to wide outs and for a total of only 54 yards. The Bills can’t expect to win with passing production like that. Hopefully when Kelvin Benjamin gets back, the wide receiver production will improve. Finally, the ground game has to stay the course. They put up over 100 yards yesterday and that has to continue. Needless to say the final five weeks are going to be very interesting. I thought that there was no way the Bills were going to beat the Chiefs and I’m glad I was wrong. This team has some toughness and character and to make it to the playoffs that pride has to remain.